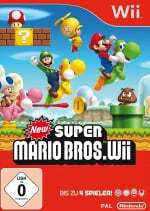 Following the warm reception to New Super Mario Bros. which was released on the DS in 2006, it was inevitable that Nintendo would bring the New Super Mario Bros. series to the Wii. Sandwiched in-between Super Mario Galaxy and Super Mario Galaxy 2 which would be released the year after, this release made perfect commercial sense for Nintendo. One of the most exciting aspects of the game was that it was the first Mario side-scrolling platformer to offer up to four player multiplayer. Players could choose to play as Mario, Luigi or Toad variants. In some ways this makes the game easier as players who die will return in a bubble so long as one player is still active. By not having to return to the beginning of the stage or the last checkpoint it alleviated some of the challenge, though the chaos of bumping into each other brought problems of its own. Iwata - Could you explain what the Super Guide is? Miyamoto - To help you progress through the level, Luigi shows you the correct path. Iwata - So it's not Mario, it's Luigi. But there are going to be those people who even when they watch the Super Guide will feel like crying, thinking: "But I can't do that!" Miyamoto - That's why the Super Guide won't only show you the correct strategy, it will also allow you to provisionally clear the course. It will present you with the option to skip the course and move on to the next one. Iwata - So in other words, by using the Super Guide, you could get right through to the end. Miyamoto - Well, since you've purchased it, it's surely better to be able to see the ending. Iwata - But isn't there a risk that by allowing that, the essence of playing an action game will somehow be lost? I said it a little earlier, but it's precisely by pushing yourself a little harder, and by failing again and again, that the feeling of achievement you get when you succeed grows. Miyamoto - We've included a number of elements in the game with that in mind. Now, I'm sure you've had times when there's been one particular place on a level that you just can't get past, no matter how hard you try. Iwata - Those are the places that will really have you on the verge of tears! Miyamoto - There are times when even if you watch the Super Guide and understand how you should to do it, you still can't manage it yourself. At times like that, you can use the Super Guide to get past the tough part then play yourself. Iwata - So partway through the Super Guide, you can take over just like that? Miyamoto - Once it's gone past the tricky part, you can press the Pause Button and change the player back to yourself. 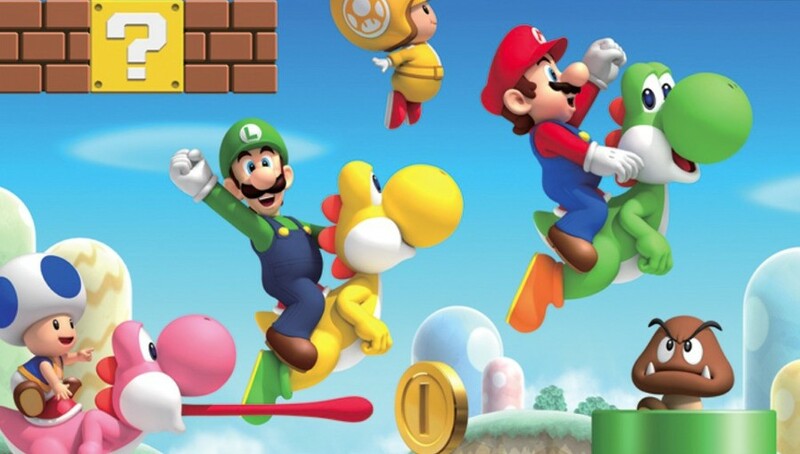 The player will be Luigi, but his jumping ability is the same as Mario's. Iwata - Novices will be happy about this feature. Miyamoto - But while it was my idea to include this feature, as a gamer, I would feel intensely irritated if you were asked, "Do you want to see the Super Guide?," right from the start of the game. Miyamoto - There's no way I could ever allow that! Mario's companion Yoshi would make a comeback in this game; one of the funniest uses for Yoshi was to eat fellow players and spit them out. The game also brings the usual power-ups such as mushrooms and fire flowers back, but in addition to this there was the introduction of the Propeller Suit, Ice Flower and Penguin Suit which added a bit of variety. The game was well received at the time and settled on an overall Metacritic score of 87. Japanese gaming magazine Famitsu called the game a "masterpiece of 2D action" and gave it a perfect score of 40/40. Nintendo Life alumni Corbie Dillard was also mighty impressed and gave it top marks in our review. Of course, not every publication would be as generous, with UK magazine Edge criticising the game for a lack of traditional Mario charm, poor graphical detail and overall easiness. They still gave it a 7/10, though. We'll leave you with this amazing New Super Mario Bros. Wii speed run from Awesome Games Done Quick 2015. As always, be sure to let us know your thoughts on the game with a comment below. This game is so good, I felt like a new man after I finished it. (I tried). 4 player was a bit marred by the whole "you can't pass through each other" deal. Still kind of fun, but this was mostly a solo affair for me. I've only ever played the two consoles "New" Super Mario games, and I very much agree with the lack of charm. Super Mario World, for example, is a game that sticks with you for years--decades, actually. NSMBWii feels rather soulless, like your typical contemporary AAA blockbuster, although more fun. NSMBU was a bit better, at least. Also, I really hate seeing the word "late" in front of Iwata's name. The only "new" that's really bad is the second on 3DS. This was a great game with lots of family memories. I just wish nintendo thought of multuplayer more. This game was the best with multiplayer! The cancer of Mario franchise. Not bad games, not gourgeous though, just repetitive and recycled games. I think the only issue with the New Super Mario bros. series is that they don't aim high like the old Super Mario Bros. games: at the time they were doing almost the best you could do on their consoles, exploring new ideas and ending up with that incredible nonlinear structure of Super Mario World, where the main exit isn't always the right one and you can go from one place to another through secret passages. New Super Mario Bros. Wii in some gameplay aspects is more limited compared to Super Mario World: you cannot take Yoshi with you in the other levels, the flying options are actually limited (even more than limited than they were in Super Mario bros. 3!) and there is not the ability of taking another item with you. Furthermore, the world maps aren't interconnected with secret passages like in Super Mario World, though there are many secret exits and the three golden coins are reminescent of the flowers of Yoshi's Island. Fortunately there are a few great moments, like the final boss fight which is really epic, but still I have the impression that with the New Super Mario Bros. Wii the developers weren't able to fully push the original 2D classics' gameplay forward and ended with something which is a bit less than that. Anyway, the returns of the Koopalings was a VERY welcome one, unfortunately they were easy bosses and in the subsequent games they have fallen victims of recycling, with the same Larry model and animations used in three games (in New Super Mario Bros. U even the artwork was recycled!)! What I find sad is that it's arguably Mario Kart 8 and Mario & Luigi: Superstar Saga which revealed us the most about them! P.S. : I must say that I always played alone, New Super Mario Bros. Wii is effectively a 4 players game so this is probably why I'm seeing it as if some compromise were made. P.P.S. : I also quite like this game, even if I find it sometimes a bit frustrating and not on par with Super Mario World. I feel NSMB Wii had a bit too much flack for the multiplayer mode, it may be frustrating with 4 players, but it's really fun with 2 or 3. I remember being at Nintendo World the just hours before the midnight release of this title, man it was crowded. At least I was able to find and buy the game I was looking for: Bowser's Inside Story. Terrible game, it was so boring I couldn't even finish it. The 4 player co-op was the only thing that kept my interest in this game and it got old quick, in every other aspect this game is recycled garbage. This is where the series went wrong. I don't personally think this game was all that bad. There were a lot of cool features in this game included for multiplayer, but the multiplayer is difficult tom work with unless you are all very competent players. If a family of differing skill levels tried to play this it wouldn't work. I say this out of personal experience. The "New" series is like eating at a local diner: predictable but ultimately satisfying. No, NEW Super Mario Bros. 2 was. @PigmaskFan 2 was worse, but Wii was still bad. The game didn't do anything significantly different, it just had a co-op mode and a handful of powerups. Not exactly exciting improvements that made a second game worth playing. I remember this being the most challenging Mario game I've played after the original. Thankfully, its not as hard as Country returns. I liked this game. At the very least, it filled the 2D Mario void I had since childhood. Never did play the multiplayer, due to a lack of functional wiimotes. I first played this game almost 2 years ago, and it took me at least a few months to get all the way through it...or so I thought. Later, I discovered a lot of the hidden exits and such, plus the Bonus World; its still very tough to access them sometimes, with the trick of timing everything properly. I think I would've liked this more if it didn't involve shaking the sideways Wiimote. That was what killed DKCR for me, that was what killed NSMBWii for me, that is what I expect to kill Kirby's Adventure Wii for me. I suppose I should give it another go, though. I think this one is still my favorite of the "new" games. Something about that propeller shroom, man, or as I liked to call it "the twirly hat." I played a lot this games with my bro and sister, awesome times! @TobiasAmaranth I've played it! It's pretty great. I liked the game but the Wii remote was uncomfortable to hold on its side for me. You couldn't use the classic controller which made it a lot worse 8/10. I much prefer New Super Mario Bros. U, especially with the addition of challenge mode. This game was okay, but not that much different from NSMBDS. 4 player co-op was fun, but at times it does get really annoying, like the game doesn't feel like it was made for 4 players, since a lot of the time there's barely any room to stand. That one second pause that happens every time someone gets hit or falls in a pit can screw you up and cause you to die. Why they didn't take that out in the next 2 NSMB games, I'll never know. The same exact themes were reused from the DS version. (And will be reused in the other NSMB games) The Koopalings was great to fight again. I wish there were other playable characters. (The two toads are alright in this game, but Nintendo could have done better with playable characters in NSMBU) Overall, this game is alright. This game feels too much like the DS version, and it's not one I would want to come back too, maybe unless I'm playing co-op with other people.